Our founders Allen & April Slaughter will be attending the DarknessRadio/TAPS event held at the Stanley Hotel in Estes Park, Colorado in November! As a staff writer for TAPS Paramagazine, April will be there as a representative for the publication. Both April and Allen will be attending as representatives for The Paranormal Source, Inc. as well and they look forward to meeting and spending time with everyone attending! Will YOU be at the Stanley for this event? Leave a comment and let us know! The P.S. 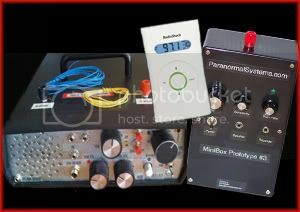 Inc. team is very fortunate to own and operate several ghost box devices for our research. We are often approached by people with a curiosity for the devices who want to know what we charge for a “reading”. It is not the practice of The Paranormal Source corporation, or of any investigative team member associated with us to charge a fee for spending time with the boxes. We do not consider, nor will we claim, that the information coming from the devices or the operator is the result of psychic sensitivities and therefore we cannot in good faith call it a “reading”. The Paranormal Source, Inc. makes no judgment on what others should do with devices they have in their possession. It is our intent to study the ghost box phenomenon and to share that information with others to interpret as they choose. Should you have any other questions or comments regarding this issue, please do not hesitate to get in touch with us via the form on our Contact page. You are currently browsing the Paranormal Source - Paranormal Research & Development Team blog archives for September, 2008.